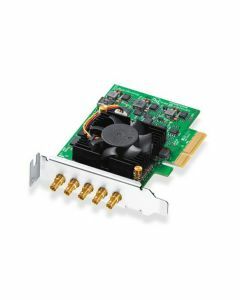 Featuring 4 independent mini 3G-SDI connections, DeckLink Duo 2 Mini is a compact, multi channel PCI Express capture and playback card that supports all SD and HD formats up to 1080p60. You get the flexibility of 4 separate capture or playback cards in one. Featuring 4 independent mini 3G-SDI connections, DeckLink Duo 2 Mini is a compact, multi channel PCI Express capture and playback card that supports all SD and HD formats up to 1080p60. You get the flexibility of 4 separate capture or playback cards in one. Plus, it’s completely customizable so it’s perfect for media play-out systems, multi screen digital signage servers, real time multi channel capture systems and more. SDI Video Inputs: 4 x bidirectional 12-bit SD/HD independently configurable as either Input or Output. SDI Video Outputs: 4 x bidirectional 12-bit SD/HD independently configurable as either Input or Output. SDI Audio Inputs: 16 channels embedded in SD and HD. SDI Audio Outputs: 16 channels embedded in SD and HD. Sync Input: Tri-Sync or Black Burst. Computer Interface: PCI Express 4 lane generation 2, compatible with 4, 8 and 16 lane PCI Express slots. Software Included: Media Express, Disk Speed Test, LiveKey, Blackmagic Desktop Video Utility and Blackmagic driver on Mac OS and Windows. Media Express, Blackmagic Desktop Video Utility and Blackmagic driver on Linux. Physical Installation: PCI Express 4 lane generation 2, compatible with 4 and 8 lane PCI Express slots on Mac OS, Windows and Linux. Mac OS systems require a Mac Pro computer with PCI Express slots. Please check the Support pages to see the full system requirements. SDI Compliance: SMPTE 259M, SMPTE 292M, SMPTE 296M, SMPTE 372M, SMPTE 425M, ITU-R BT.656 and ITU-R BT.601. SDI Metadata Support: RP 188/SMPTE 12M-2 and closed captioning. SDI Color Precision: 8, 10, 12-bit RGB 4:4:4 in all modes up to 1080p30 and 8, 10-bit YUV 4:2:2 in all modes. 12-bit RGB 4:4:4 only supported in playback. SDI Video Sampling: 8, 10, 12-bit RGB 4:4:4 in all modes up to 1080p30 and 8, 10-bit YUV 4:2:2 in all modes. 12-bit RGB 4:4:4 only supported in playback. HD Down Conversion: Built in, high quality software down converter on playback and capture. Down converted SD selectable between letterbox and anamorphic 16:9 styles. HD Up Conversion: Built in, high quality software up converter from SD to 720HD or 1080HD on input. Selectable between 4:3 pillarbox, 14:9 zoom and 16:9 zoom. Cross Conversion: Built in, high quality software cross conversion from 720HD to 1080HD, 1080HD to 720HD on playback. Real Time Effects: DaVinci Resolve, Final Cut Pro X internal effects. Adobe Premiere Pro CC Mercury Playback Engine effects. Avid Media Composer internal effects.